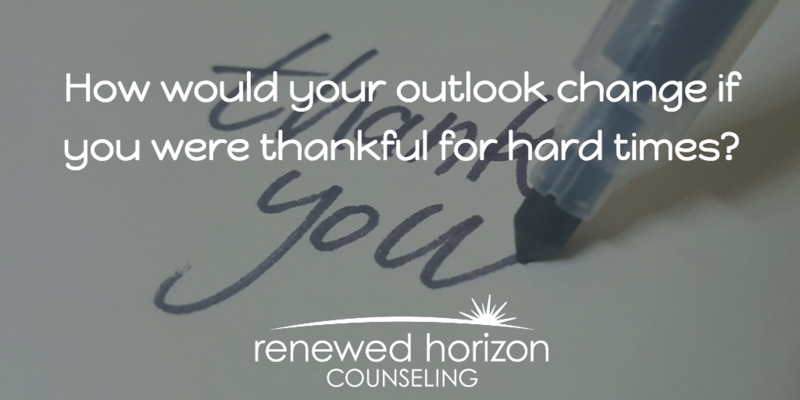 Have you ever been grateful for a hard time after you’ve gone through it? A moment you can look back and see the growth and change that happened because of the pain. In this Thanksgiving season, I challenge you to look at struggles in a whole new way…with gratitude!! This may seem paradoxical, but step back and think about it. Most of us have had similar experiences with reflecting on hard seasons and being thankful that they’re over and for all they taught us. So if you will likely reflect and be thankful afterwards, why not move the timeline up and look for how you can be thankful during the struggle? Sure we don’t “invite” or wish for struggles. But struggles are unavoidable in life. How you look hard times will make a difference in how you cope with them. We’ve all heard the phrase- “No pain, No gain”. This is true! Making changes and growth spurts are rarely out of a happy and easy time. It happens because of the pain! So you can say “thank you” to your pain because you know that the other side holds some good insight and perspective to make future changes. God doesn’t waste suffering. His Word says He will use it for good. We will rarely have a glimpse into the ‘good’ that God intends from our pain until afterwards. But next time you are in a difficult season, you can cling to the hope that He is at work and it will be good. Some people reject change, while others embrace it. Change can be scary because it’s unknown. I want you to think about the beautiful changes you’ve experienced around you. Maybe it’s in your own life, or the life of someone you love. Maybe it’s an inspiring story you’ve heard. It could even be the change of the leaves this time of year or the beautiful transformation of a butterfly. We should be thankful for our pain because we know there is potential for a beautiful change because of it. I Peter 1 talks about how trials will test our faith and bring us to a greater understanding of our need for Jesus Christ and the hope of salvation through Him. This is a major reason to say “Thank you” to your pain. Our struggles remind us of the hope we have that our worldly pain will end someday when we get to Heaven. Our pain gets us re-focused on our need to be God reliant. When people read the verse, James 1:2 “Count it all joy, my brothers, when you meet trials of various kinds,” They often get confused about how and why they would have JOY during a trial. But as you can see from these 4 reasons to say “Thank you” to your pain, there can be joy in what a trial may bring! Is hard for you to say “thank you” to your pain?